Almond Eyes, Lotus Feet is a fictional memoir of a wise Indian princess, who recalls the ways the women of the Indian court found friendship, faith, and love through their beauty traditions. Authors Sharada Dwivedi and Shalini Devi Holkar write about how ‘creams can never compare with oils no matter how rich they may be. They just don’t have the same effect’. The book is replete with innumerous accounts of almonds, coconut, turmeric and saffron threads being simmered over low heat until a rich aroma indicates a release of oils. This paste was, in earlier times, applied over the face and body, after dipping one’s hands in jasmine oil. 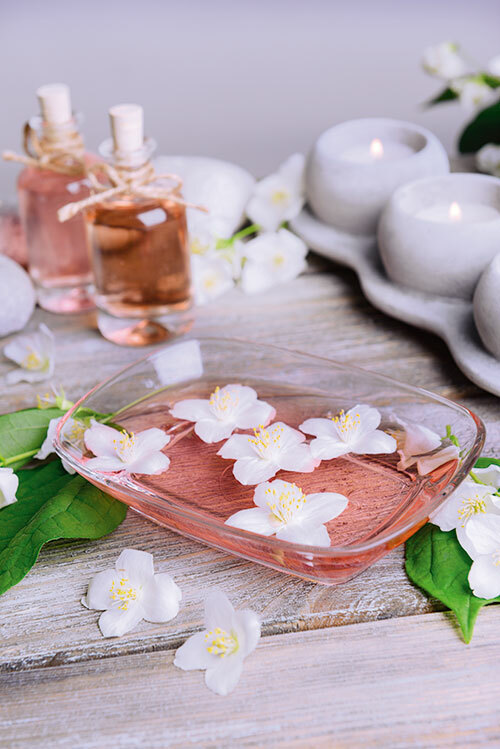 Today, with the green movement in skincare, oils have graduated from being a home remedy to a mainstream category as these don’t require the presence of strong preservatives. And, unlike the traditional ones, these new-age entrants are light and pleasantly fragrant. “With advanced technology, oils work with the skin’s own cycle of renewal, adding health and luminosity every day,” says Dr Tom Mammone, executive director of skin physiology and pharmacology, Clinique. The brand’s Smart Treatment Oil is non-greasy and infused with anti-ageing ingredients that claim to leave the skin instantly radiant. The 28-day Divine Renewal Program by L’Occitane introduces blends in a single-dose format. The rare immortelle essential oil in this range contains a high concentration of active molecules that rejuvenates overworked, dull skin. Kiehl’s chemists developed the Daily Reviving Concentrate with 100-per-cent natural-origin ingredients that are a blend of essential and botanical oils. “These not only create a protective layer that diminishes the penetration of environmental aggressors, but also continuously provide daytime hydration,” notes Dr Adam Geyer, the brand’s consulting dermatologist. In its Oils of Life line, The Body Shop taps into the power of seed oils. “The Body Shop has always taken inspiration from traditional beauty rituals and when our team discovered the potency of seed oils from Egypt, Chile and China, we decided to create a skincare range around them,” states Arnaud Jeanteur, general manager of The Body Shop International. Busting the myth that oil works only on dry skin is Clarins Lotus Face Treatment Oil — a purifying treatment that tones and balances oily skin types. Another effective product for glowing skin is Honey Avocado Face Pack by Wikka, which is a combination of forest honey and nourishing avocado oil. In India, oils have always been part of our wellness heritage. “Ayurveda believes that a daily oil massage is the secret to a youthful body and a bright face. In fact, our texts have always maintained that these are more effective for skin than creams,” states Gita Ramesh, joint managing director, Kairali Ayurvedic Group. Its smaller molecular structure allows easy penetration into the skin, delivering the benefits to all the cells in the body. 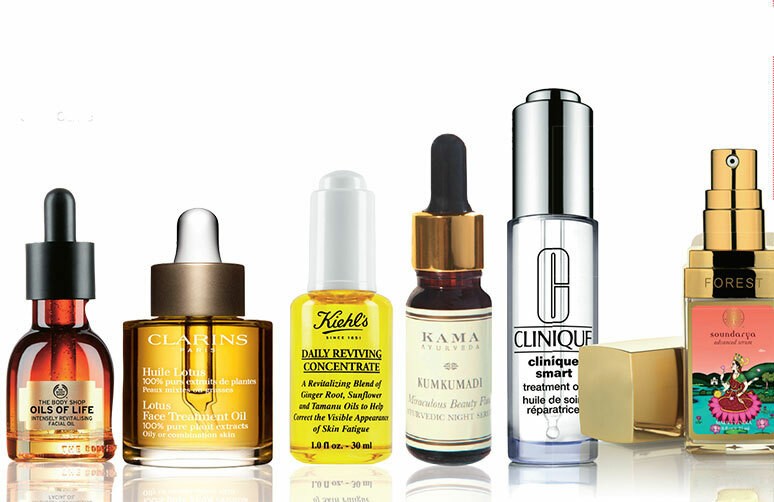 Oils should be selected according to skin type for best results. Those with dry skin should try sesame oil blends whereas almond oil should be used for oily skin. The signature facial at Jiva Spa, which is the Taj Group of Hotels’ in-house spa across all properties, pampers the face with an exclusive range of decadent and rare hand-blended oils tailored to your skin type. It’s interesting to note that most of the serums by luxury Ayurvedic brands are actually facial oils. “We called it a serum as this is the accepted nomenclature, and globally everyone understands the term. This is why the Kumkumadi Miraculous Beauty Fluid serum has to be applied on skin that has been dampened with water or rose water as the oil sinks only into damp skin. Typically, face serums have to be applied on dry skin and are often followed by the application of a moisturiser or night cream,” elaborates Vivek Sahni, director, Kama Ayurveda, on the brand’s bestseller. In ancient Ayurvedic texts, there are various references to the royals and elites using skin oils. “Precious herbs like saffron, manjistha (Indian madder) and lodhra (lodh) were infused in a mix of oils, fresh cow’s milk, ghee and herbal roots. This concoction was left to cure in copper vats which imparted their own properties to the oil, making it more effective,” states Dr Ipsita Chatterjee, senior manager (training), Forest Essentials, who points out that their Soundarya Advanced Serum is an improved and modern version of the facial oil. While we feel trading the creams for oils might be a tad too drastic, it’s time to make space for the new arrival on your dresser. Serums are targeted treatments that focus on specific skincare concerns such as dullness, hyperpigmentation or wrinkles. It is applied before the moisturiser. On the other hand, oil revitalises and retexturises skin to restore its brilliance and smoothness. After cleansing, dispense two drops of oil and gently warm them by rubbing your palms together. Pat into skin. Avoid eye area. The lightweight oil glides over skin easily and is absorbed quickly without leaving a greasy or oily film. 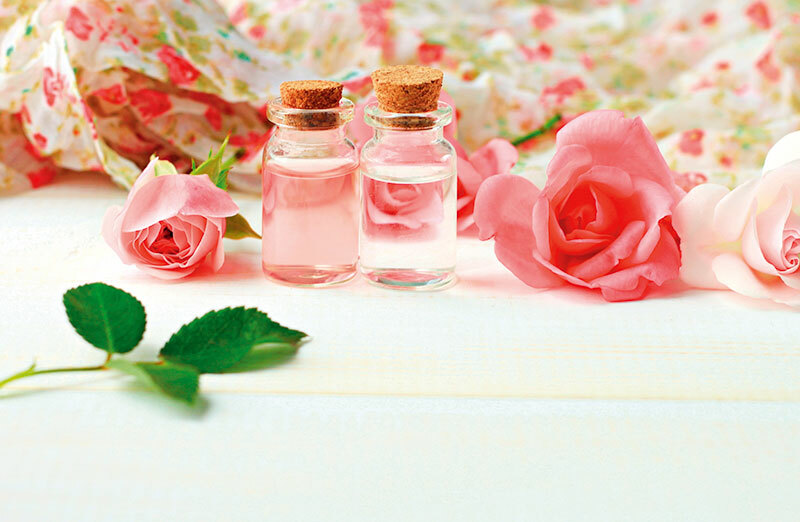 For added radiance, a few drops of oil can be mixed with a daily moisturiser. Lastly, for extra conditioning, apply it after your daily moisturiser to seal in everything that has been applied. Castor oil: a tiny smear on the lashes at bedtime is known to thicken them. In India, even little girls’ eyes are decorated with kohl or kajal mixed with this oil which helps strengthening eyelashes. Almond oil: lightly apply around the eye area for 20 minutes before bedtime. Wipe off gently with moist cotton wool before sleeping to prevent puffiness of eyes. Sesame oil: it helps tighten facial skin, particularly around the nose, controlling the usual enlargement of pores as skin ages chronologically. With sesame oil, no cosmetics are needed, as this gives you radiant complexion. 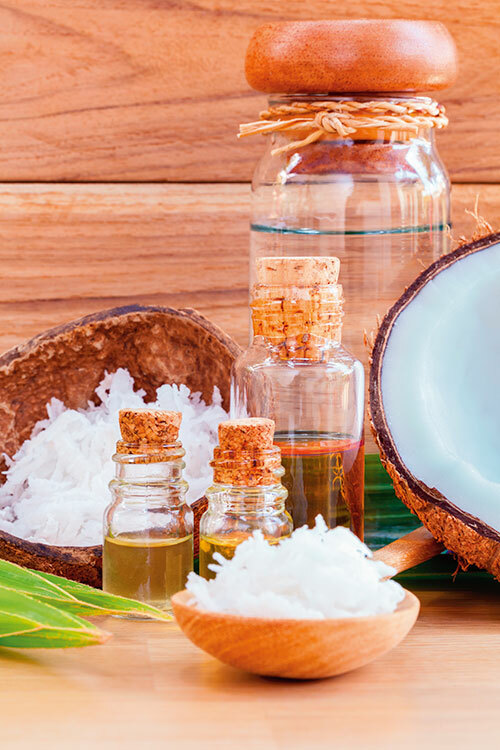 Coconut oil: in its pure form, coconut oil is light and soothing for the face and body. Since it moisturises and cools, it’s ideal for hot tropical climates. Kumkumadi oil: this anti-ageing potion has around 16 highly potent ingredients, including saffron, sandalwood, turmeric, lotus pollen, vetiver and liquorice. Nalpamaradi oil: a skin illuminator and natural sunscreen, it is a mix of sesame oil, vetiver, turmeric, gooseberry and Indian madder. Jwalini oil: it is described in the ancient texts as the ideal treatment for clear skin, it contains herbs that are processed in pure coconut milk and sesame oil.